(AP) YANGON, Burma - Burma abolished direct censorship of the media Monday in the most dramatic move yet toward allowing freedom of expression in the long-repressed nation. But related laws and practices that may lead to self-censorship raise doubt about how much will change. Under the new rules, journalists will no longer have to submit their work to state censors before publication as they for almost half a century. However, the same harsh laws that have allowed Burma's rulers to jail, blacklist and control the media in the name of protecting national security remain unchanged and on the books. For decades, this Southeast Asian nation's reporters had been regarded as among the most restricted in the world, subjected to routine state surveillance, phone taps and censorship so intense that independent papers could not publish on a daily basis. President Thein Sein's reformist government has significantly relaxed media controls over the last year, though, allowing reporters to print material that would have been unthinkable during the era of absolute military rule  like photographs of opposition leader Aung San Suu Kyi. The Information Ministry, which has long controlled what can be printed, made the announcement on its website Monday. The head of the ministry's Press Scrutiny and Registration Department, Tint Swe, also conveyed the news to a group of editors in the country's main city Yangon. The move had been expected for months but was repeatedly delayed as the government struggles to draft a new media law to overhaul the industry here. Tint Swe previously said the censor board itself would be abolished when censorship ends. But Monday's announcement indicated the board will stay and retain the powers it has always had to suspend publications or revoking publishing licenses if they deem publishing rules are violated. Nyein Nyein Naing, an editor from the Seven Day News Journal who attended Monday's meeting, said journalists will still have to submit their articles to the censor board. But now, she said, they will be required to do so after publication, apparently to allow the government to determine whether any publishing laws are violated. Those laws, in place since a military coup in 1962, include edicts prohibiting journalists from writing articles that could threaten peace and stability, oppose the constitution or insult ethnic groups. Critics say some laws are open to interpretation and give the government enormous power to go after its critics. They have been used repeatedly in recent years to jail members of the press. Nyein Nyein Naing welcomed the government announcement, as did other journalists in Burma, also known as Myanmar. But she added: "We have to be very cautious as (the state censor board) will keep monitoring us." It was not immediately clear to what degree continued government scrutiny could lead to self-censorship. Some topics remain highly sensitive, like corruption and alleged abuses committed by army officers during the previous ruling junta. Overzealous authorities could use the threat of prosecution to prevent articles from being published or exact harsh punishments for material they don't like. Late last month, the censor board wielded some of that power by ordering the suspension of two weekly magazines  The Voice Weekly and Envoy  for speculating on a still-anticipated Cabinet reshuffle. Those punishments have since been lifted, and the two magazines are due to begin publishing again on Aug. 18. 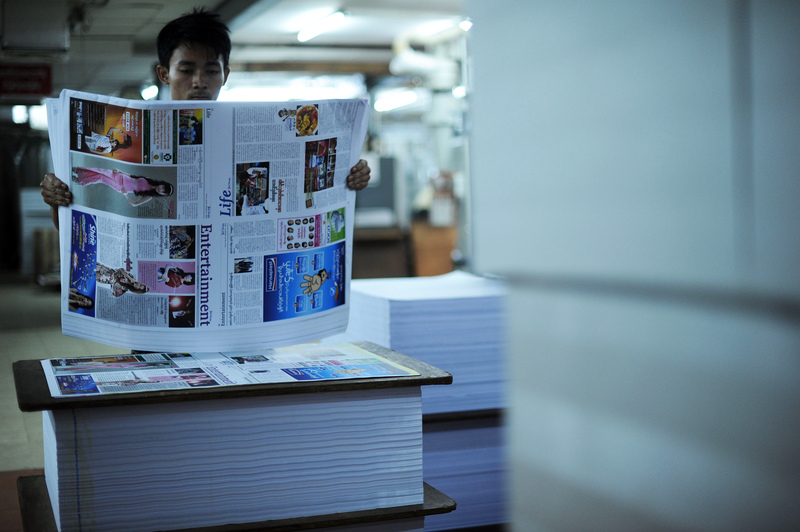 Shawn Crispin, the Committee to Protect Journalist's Southeast Asia representative in Bangkok, said that "if the government is sincere in ending pre-publication censorship, it would represent a significant step forward for press freedom in Burma." However, if press laws are not reformed as well, "then all of these promises can be easily rolled back if they feel a free press threatens government security," Crispin said. Since last year, when the nation's long-entrenched military junta ceded power to a nominally civilian administration dominated by retired army officers, censorship has ended on subjects such as health, entertainment, fashion and sports. Media outlets publishing such topics  deemed less sensitive  were allowed to publish without submitting their work to state censors beforehand. Monday's announcement means the rest  more than 140 newspapers and magazines focused on things like politics and religion  will have the same freedoms. Tint Swe said, however, that independent papers were not yet allowed to publish on a daily basis, despite the change. But he added: "That is coming soon."